In an era when organizational commitment is seemingly at a low point, physician engagement and retention is understandably a hot topic amongst leadership at hospitals large and small. Meanwhile, today’s physicians are constantly struggling with new demands on their time. Over the last several years with increased adoption of EHRs and the advent of Meaningful Use, clerical claims on physicians time have increased dramatically, leaving physicians struggling to “find” time by taking it from other tasks or cutting back on patient load. Factor in the new requirements of ICD-10 Documentation Improvement coming down the pike and one is left to wonder how today’s physicians can keep up. There is so much chatter about the overwhelming amount of time today’s physicians use on non-clinical paperwork, the onus is on healthcare administrators to find a way to minimize it. Like so many things in life, a proactive physician communication initiative will yield benefits proportionate to the thoughtfulness that was put into it. So step one to wow your docs is to include them in the process. Ask the simple question of what would be helpful. However, be prepared that like most non-technical intranet users, the physicians may not be aware of the possibilities of what can be accomplished. 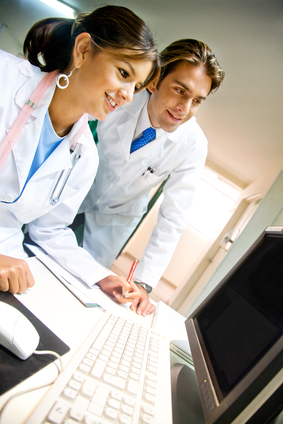 For that reason, shrewd intranet visionaries should walk a mile in the physician’s shoes. Walking a mile in a physician’s shoes and seeing firsthand the dots that might be connected can yield an epiphany for the ambitious IT or communications staffer. Honestly, who would be more of a hero amongst a hospital’s administrative staff than the guy that just won over the medical staff? Gold star for that one! These items really just scratch the surface of what content could be published on your intranet to give your physicians that crystal ball they wish they had. Other things that can be done to simplify physician access further include user experience considerations. A simple but significant thing that can make access easier for docs is to automatically redirect them to a physician-specific welcome page once they have signed in as a physician. When you get to the point of optimizing the physician user experience, going through workflows with a fine-tooth comb to eliminate any click you can to more directly get them where they need to be is time well-spent. User interface simplification for our single-click focused society is a must-do. Hopefully some of these ideas resonate for your healthcare organization. What other information have you found helpful to arm your physicians with? Please share your ideas.